Donald Trump is far ahead in the delegate count and polling in the GOP primary race, with 943 delegates yet to be awarded. However, Cruz and Kasich are hanging on, hoping against hope for a brokered convention that will deliver to one of the two pretenders the keys to the White House. Sad propositions, both. Trump needs just over half (53.3%) of the remaining delegates to secure the nomination on the first ballot. Powdered Wig is holding fast to our prediction that The Donald will surpass the magic number of 1,237 delegates on or before June 7. You have to wonder why there is any resistance to Donald Trump at all. The short answer is ignorance and apathy! Ignorance: Many who dislike Donald Trump do so because they have been told he is a liberal. People who believe that fantasy opposition talking point apparently do not or cannot read. Otherwise, they would have taken a few minutes to read Trump’s platform. If a secure border, a strong military, an “America First” trade policy, fiscal responsibility, immigration control, and smaller government are liberal ideas, then I suppose Donald Trump is a liberal. Except they are not liberal ideas. They are uber-conservative ideas, but you would need at least a double-digit IQ to understand that. There are a few brain-dead voters who dislike Trump because he is “cocky” or “conceited” or “not nice.” When I hear that tired refrain I ask the accuser a simple question: “If you are suddenly diagnosed with a brain tumor and require emergency surgery, are you going to hire the most competent brain surgeon you can find, who is very likely to be “cocky” and “not nice,” or are you going to hire the nicest guy you know, your next door neighbor, an unemployed plumber?” This question typically provokes an eruption of childish invective, a sure sign that the argument has been won. Do we want a competent leader in the White House or a nice guy bullshitter who lies through his teeth? I cannot understand why this is a difficult question for some people. Apathy: The sad fact is many people don’t care. They are simply unable to connect the dots between the screwing they are receiving from government, at all levels, and the tremendous loss of liberty and prosperity that that means for their children’s futures. As long as the fridge is full and American Idol is on, who cares about silly things like the future of our children? A perfect example of American apathy is Operation American Spring. Colonel Harry Riley organized Operation American Spring last May, the purpose of which was to recruit as many patriots as could be mustered to march on Washington and demand the removal of Barack Hussein from office, as well as six other anti-American career parasites in our federal government. I was very much encouraged by the response from patriots nationwide and I supported the effort as well as I could via Powdered Wig from 5,000 miles away. Two million red-blooded Americans committed to being there in Washington in support of OAS. A couple thousand showed up, just enough to provoke a good chuckle from Barack Hussein and his fellow career parasites on Capitol Hill. I guarantee you if the two million patriots who committed had shown up, every rep and senator would have been hiding under his or her desk, and good things would have happened! The open letter below is from Colonel Riley to America. He emailed it to me recently and I am publishing it in full. The good colonel is absolutely correct! There is one chance to save our beloved country at this point, and his name is Donald Trump! Toward the end of my military service in the late 80s early 90s, I came to the conclusion the United States of America could never be defeated militarily and for that matter any nation that could try would never do it. The principle of “assured mass destruction” is still valid. It was and still is very clear to me that America’s demise will come through internal rot and outside migration without assimilation, with destruction as a goal. This rot takes many forms but the most damaging is the loss of patriotism and allegiance to our God ordained Constitution, loss of moral courage by those allowed to occupy positions of trust, the total surrender of United States three branches of government oversight responsibility, and the total decay of personal integrity and rejection of Christian principles. So, here we are at a crossroads in our very existence as a Republic, a nation of laws. We are witnessing chaos in the streets, a political system controlled by self-serving mafia that is battling an outsider by the name of Trump, and a population that is starting to wake-up. Will the wake-up be too late and with too little motivation to reverse the destructive course America is traveling? As a fox-hole survivor, one who understands what it means to take an oath to the US Constitution, I will never surrender. I pray America has recognized the threat to our Constitution through corruption, thievery, criminal activity in our political establishment, and that we will do everything within our power, everything just short of criminal activity, to elect Donald Trump as our next president. Donald Trump is not a perfect individual, (most of us live in glass houses) I don’t like some of his antics, but I do like his attitude in support of America, his proven ability to get things done, his no-nonsense and straight talk, his freedom from any campaign support obligation, he hasn’t spent his life sucking the public teat, which is putting the existing political apparatus in panic if not chaos. The current republican party makes no bones about their displeasure with Trump. They are taking every action possible, bringing to bear every anti-Trump side-show they can dream up, and attempt to destroy Trumps freedom of speech at campaign rallies. Trump does not fit the mold of the establishment and they cannot take a chance on him upsetting their golden goose existence. Certainly we can understand that when the entire republican establishment is in involved in a no-holds barred to eliminate Trump, he must be someone special. He is scaring the dog-crap out the greedy elites and threatening their free-rides that has been going on for decades. We need a man like Trump “for such a time as this”. If the establishment despises Trump so much, it’s a sure sign it’s absolutely critical and demanding that we pack the ballot box in support of Trump. Finally, is it possible the establishment in their panic and chaos are totally overlooking the fact that Trump’s popularity is being heaped on him by “we the people”? Trump hasn’t generated the massive voting for his candidacy, he has tapped into the anger, disgust, fed up America and is trumpeting the message of “we the people”. Cruz, Kasich, or any other others offer nothing but more of the same and we know what that has given us. And there is another factor regarding Cruz…he is not eligible as a “natural born citizen” required by the Constitution to serve as president…if he were nominated I could not vote for him and dishonor our Constitution again. 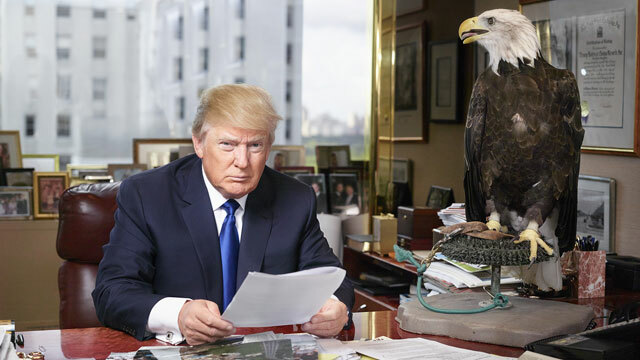 The establishment is vicious and will even try to override the will of “we the people” in order to retain their prized positions…we must stop them and Donald Trump is the only hope we have. Trump may be the last chance for America to retain our Republic…we can’t squander this potential opportunity to get our nation back on track. Let us… democrats, republicans, independents, unify and elect Donald Trump as president who will be no puppet of the vile political establishment, but pursue restoration of Constitutional government, with a refreshing attitude of power to “we the people”.